Lega Nord is a conservative and right-wing populist party in Italy. It is led by Matteo Salvini. While once a regionalist and left-of-center party, Lega Nord has since shifted strongly toward the right and tried to appeal to Italian voters throughout the country. Much of this shift occurred shortly before and after Matteo Salvini, who led the effort to expand it from just a regional party, became its leader in 2013. While Lega Nord was in serious trouble when Salvini became party leader, he significantly grew the party to become the country's dominant political force by 2018 through focusing on a nationalist and populist agenda similar to that of U.S. President Donald Trump. The party was renamed "The League" for the 2018 general election, and it made massive gains, quadrupling its vote share. While it strongly opposes immigration, it elected the first black senator in Italian history, contrary to left-wing caricatures of it. Lega performed so well that it became the dominant party in its coalition, overtaking Silvio Berlusconi's establishment Forza Italia, and Salvini had a very real chance of becoming Italy's prime minister. In April 2018, during government coalition negotiations, the Northern League performed very well in an election in the Italian region of Friuli Venezia Giulia, and it performed very well in local elections in June, after the creation of a coalition government. An Italian poll in June 2018 found that Lega Nord had become the most popular party in Italy for the first time. In the local elections held later that year, the League and its right-of-center alliance performed very well, even taking control of several cities under left-wing control for decades. By early 2019, the League had doubled in popularity. 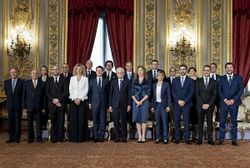 In May 2018, the League and the fellow anti-establishment Five Star Movement agreed to a common platform, one that promoted strongly nationalist and anti-establishment policies. Both parties allowed their voters to choose whether they approved of the coalition agenda. Despite this, Italy's establishment president rejected the coalition government as it supported nominating a Euroskeptic finance minister. However, a few days later, the two parties were able to reach a compromise with Italy's president and finalized their governing coalition. The new government, Western Europe's first one completely run by populist and anti-establishment parties, was sworn in on June 1, 2018. The League received several important government positions, including Salvini as Interior Minister and in charge of Italy's immigration policy, and Lorenzo Fontana, a strong pro-life and social conservative advocate, as the minister in charge of family policy, among others. With Salvini in charge of Italy's immigration policies, the League showed it was serious about securing Italy's borders. For example, early in the coalition government, Salvini refused to let a boat carrying over 600 migrants land in Italy as the country shared an undue immigration burden, and he said he would continue such actions. By the end of 2018, migrant ships stopped their activities because of Italian pressure. The coalition announced it would crack down on illegal street vendors, many of whom are migrants. In July 2018, Salvini blocked a private Italian ship carrying migrants from docking. He also ordered that benefits for asylum seekers be massively reduced. In September 2018, Salvini signed a decree which, among other actions, would ban residency permits for humanitarian reasons, increase funding for deportation centers, and removed citizenship from terrorists. In November 2018, the coalition government announced it would not sign the UN Global Compact on Migration. Migrant deportations increased 28% in the government's first six months in power, and in 2018, the level of illegal immigration to Italy fell 80% while it doubled for Spain. Migration levels continued to dramatically fall, something confirmed by Frontex data. The League pushed to make is more difficult for non-EU migrants to join a proposed basic income program supported by the M5S. In August 2018, Salvini announced change Italian identification forms to list one's "mother" and "father", rather than "parent one" and "parent two." In December 2018, the Italian Education Ministry, controlled by an ally of the League, gave approval to setting up crucifixes and nativity scenes in classrooms. Salvini promoted gun rights as interior minister, and the League did the same. In March 2019, the Italian legislature passed a self-defense law Salvini and the League supported. Salvini and the League took a confrontational stance toward the European Union. The League continued growing in popularity and became the most popular party in the country by 2018. It continued winning regional elections, including breaking 25 years of left-wing rule in the southern region of Basilicata. Lega Nord takes Euroskeptic positions and supports leaving the Euro. It also takes nationalist positions, supporting putting the Italian people first when making policy, as opposed to advancing globalist ideals. The party takes a skeptical stance on China's Belt and Road Initiative, with Salvini warning against foreign companies "colonizing Italy." Lega Nord also takes a strong position against mass migration and Islam, and it supports strong border security actions. The League also supports enacting tariffs on foreign products. Under Salvini, Lega Nord has aligned itself with other like-minded parties and politicians in Europe, including the French National Front led by Marine Le Pen and Party for Freedom led by Geert Wilders. It is highly critical of George Soros. Antifa and anarchist groups have targeted Lega Nord because of its beliefs. Lega Nord supports preserving Italy's traditional Christian culture. Notably, in 2018, the League-controlled government of Lombardy blocked a Muslim association from buying and converting a Christian chapel. The League is pro-life and led the successful effort to declare Verona a "city in favour of life." Several members of the League, including Salvini and Italy's family and education ministers, have spoken at the pro-family World Congress of Families. The League takes tough-on-crime positions and supports the chemical castration of rapists. ↑ Tomlinson, Chris (March 7, 2018). Right-Wing Italian Populist Is First Black Senator in Country’s History. Breitbart News. Retrieved March 7, 2018. ↑ Osborne, Samuel (March 7, 2018). Italy elects first black senator in history, for anti-immigration Lega party. The Independent. Retrieved March 7, 2018. Italy's League set for big regional victory, bolsters national standing. Reuters. April 30, 2018. Retrieved April 30, 2018. Right Wing Populist League Party Wins Big in Italian Regional Vote. Breitbart News. Retrieved May 1, 2018. Italy local elections: League surges while Five Star Movement struggles. The Local. June 11, 2018. Retrieved June 11, 2018. Williams, Thomas D. (June 11, 2018). Italy’s Populist League Dominates Municipal Elections Sunday. Breitbart News. Retrieved June 11, 2018. ↑ Tomlinson, Chris (June 20, 2018). New Poll Shows Populist La Lega Most Popular Party In Italy For the First Time. Breitbart News. Retrieved June 20, 2018. Williams, Thomas D. (June 27, 2018). Italy’s Populist ‘League’ Party Secures First Place in National Poll. Breitbart News. Retrieved June 27, 2018. Williams, Thomas D. (July 4, 2018). Poll: Populist Salvini the Most Trusted Politician in Italy. Breitbart News. Retrieved July 4, 2018. Politi, James (June 25, 2018). Salvini’s League storms to victory in Italy’s municipal elections. Financial Times. Retrieved June 25, 2018. Italy's League advances in local polls amid immigration crackdown. Reuters. Retrieved June 25, 2018. Albanese, Chiara; Totaro, Lorenzo (June 25, 2018). Salvini’s Anti-Migrant League Surges in Italy Mayoral Vote. Bloomberg. Retrieved June 25, 2018. Centre right coalition takes 'fortresses' of the left in regional elections. The Local. Retrieved June 25, 2018. Williams, Thomas D. (June 11, 2018). Italy’s Populist League Dominates Municipal Elections Sunday. Breitbart News. Retrieved June 25, 2018. Jones, Gavin (June 11, 2018). Italy local polls see gains for far-right League, setbacks for 5-Star, center-left. Reuters. Retrieved June 25, 2018. Italy local elections: League surges while Five Star Movement struggles. The Local. Retrieved June 25, 2018. ↑ Williams, Thomas D. (March 19, 2019). Italy: Matteo Salvini’s League Party Doubles Popularity. Breitbart News. Retrieved March 19, 2019. Shaw, Adam (May 19, 2018). Italy on cusp of populist coalition after parties publish radical joint program. Fox News. Retrieved May 20, 2018. Lane, Oliver JJ (May 18, 2018). Italian Populists Publish Governing Contract, Slams Failure of ‘Unsustainable’ Immigration. Breitbart News. Retrieved May 20, 2018. Politi, James; Romei, Valentina (May 18, 2018). Five Star and League strike Italy government deal. Financial Times. Retrieved May 20, 2018. ↑ Segreti, Giulia (May 20, 2018). Italians back League, 5-Star plan as groups ready government team. Reuters. Retrieved May 20, 2018. Barigazzi, Jacopo (May 20, 2018). 6 out of 10 Italians approve of populist government: survey. Politico. Retrieved May 20, 2018. Williams, Thomas D. (May 27, 2018). Sabotage: Italian President Blocks Eurosceptic Coalition Govt, Populist Leader Calls for Impeachment. Breitbart News. Retrieved May 27, 2018. Zampano, Giada (May 27, 2018). Italy’s president scotches populist governing alliance. Politico. Retrieved May 27, 2018. Montgomery, Jack (May 31, 2018). Breakthrough: Populist Italian Govt Back on the Cards as Five-Star and Lega Ink Fresh Deal. Breitbart News. Retrieved May 31, 2018. Scherer, Steve; Jones, Gavin (May 31, 2018). Italy's anti-establishment leaders revive governing coalition. Reuters. Retrieved May 31, 2018. Barry, Colleen (May 31, 2018). Italy gets western Europe’s 1st populist govt on second try. Associated Press. Retrieved May 31, 2018. Horowitz, Jason (May 31, 2018). Italy's Populist Parties Win Approval to Form Government. The New York Times. Retrieved May 31, 2018. Deacon, Liam (May 31, 2018). POLLS: Populist Support Surges in Italy, Nationalist Lega Closes Gap on Five-Star. Breitbart News. Retrieved May 31, 2018. Italy’s Lega Secures Enough Cabinet Posts to Roll Out Flagship Policies - Member. Sputnik News. June 1, 2018. Retrieved June 3, 2018. Said-Moorhouse, Lauren; Mezzofiore, Gianluca (June 1, 2018). Meet the populist players taking power in Italy. CNN. Retrieved June 4, 2018. Williams, Thomas D. (August 3, 2018). Italy Family Minister Calls for Repeal of Hate Speech Law Used as ‘Ideological Weapon’ by Globalists. Breitbart News. Retrieved August 3, 2018. Santoro, Vincenzina (July 3, 2018). Italy’s New Pro-life Minister for Families Hits the Ground Running!. The Human Life Review. Retrieved January 3, 2019. ↑ Tomlinson, Chris (June 27, 2018). Italy to Crack Down on Migrant Street Vendors with Massive Fines for Sellers and Buyers. Breitbart News. Retrieved June 27, 2018. ↑ https://www.thelocal.it/20180710/italy-turns-away-private-italian-ship-vos-thalassa-rescued-migrants-libya For the first time, Italy prevents a private Italian ship from docking with rescued migrants]. The Local. July 10, 2018. Retrieved July 11, 2018. Friedman, Victoria (December 6, 2018). Italy Cuts Illegal Migration Sea Landings by 80 Per Cent. Breitbart News. Retrieved December 6, 2018. ↑ Italy makes it harder for non-EU immigrants to claim 'citizens' income'. The Local. February 20, 2019. Retrieved February 26, 2019. Mainwaring, Doug (December 3, 2018). In blow to political correctness, Italy wants crucifixes and nativity scenes in all classrooms. LifeSiteNews. Retrieved December 4, 2018. Duke, Selwyn (December 8, 2018). Answering Atheists: Italy’s New Government Promotes Christ in Schools. The New American. Retrieved December 8, 2018. ↑ Williams, Thomas D. (October 6, 2018). Italy’s Populist League Party Hits Historic High in Popularity. Breitbart News. Retrieved October 6, 2018. Italy’s Salvini Wins Big in Regional Election: ‘Now to Change Europe’. Breitbart News (from the Associated Press). March 25, 2019. Retrieved March 25, 2019. More local election success for Italy's right wing in Basilicata. The Local. March 25, 2019. Retrieved March 25, 2019. Follain, John; Totaro, Lorenzo (March 25, 2019). Salvini Sets Course for European Vote After New Regional Win. Bloomberg. Retrieved March 25, 2019. Giuffrida, Angela (March 25, 2019). Far-right Italian deputy Matteo Salvini takes Basilicata in south. The Guardian'. Retrieved March 25, 2019. Sciorilli Borrelli, Silvia (March 25, 2019). Italian right-wing coalition triumphs in regional election. Politico. Retrieved March 25, 2019. ANALYSIS: Salvini's League is in charge in Italy – these local elections prove it. The Local. February 28, 2019. Retrieved March 25, 2019. ↑ 43.0 43.1 Montgomery, Jack (January 6, 2018). Italy’s Lega Nord Commits to Leaving the Euro, Tripling Deportations, and Securing the Border. Breitbart News. Retrieved March 4, 2018. Follain, John (March 11, 2019). Salvini Warns Against ‘Colonizing Italy’ Before China Accord. Bloomberg. Retrieved March 23, 2019. Sciorilli Borrelli, Silvia (March 13, 2019). Silk Road opens a rift in Italy’s government. Politico. Retrieved March 25, 2019. ↑ Williams, Thomas D. (January 31, 2018). Italy’s Salvini Promises Sealed Borders, ‘Today’s Islam Is a Danger’. Breitbart News. Retrieved January 31, 2018. ↑ Tomlinson, Chris (February 28, 2018). Italian Populist Leader Slams Pro-Migrant Bishop: ‘The Gospel Doesn’t Say to Welcome Everyone’. Breitbart News. Retrieved March 4, 2018. ↑ Friedman, Victoria (June 4, 2018). Italian Populist: We’re Going in the ‘Right Direction’ If Soros Is Worried. Breitbart News. Retrieved June 4, 2018. Tomlinson, Chris (August 16, 2018). Far-Left Anarchist Extremists Take Credit For Bombing Italian Populist Party Office. Breitbart News. Retrieved August 16, 2018. Williams, Thomas D. (October 21, 2018). Antifa-Style Activists in Italy Attempt Assault on Matteo Salvini. Breitbart News. Retrieved October 21, 2018. Williams, Thomas D. (January 25, 2019). Matteo Salvini Says Leftist Vandals Are ‘Red Nazis’. Breitbart News. Retrieved January 25, 2019. ↑ Italy's League blocks Muslims from buying and converting chapel. Reuters. October 28, 2018. Retrieved October 28, 2018. ↑ Verona, city of Romeo and Juliet, declares itself pro-life. LifeSiteNews (from the Society for the Protection of Unborn Children). October 8, 2018. Retrieved January 3, 2019. Tomlinson, Chris (March 19, 2019). Salvini Pro-Family Congress Attendance Sparks Italy Coalition Conflict. Breitbart News. Retrieved March 30, 2019.